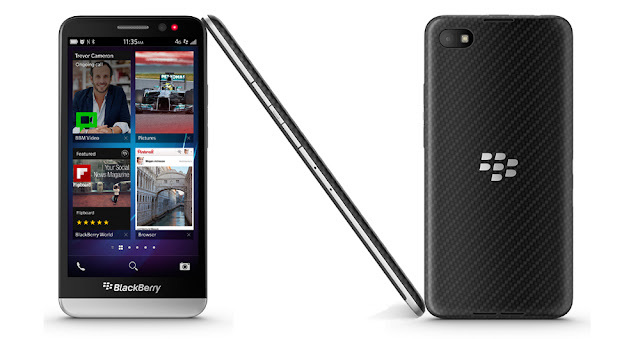 BlackBerry - A smartphone maker company has just announced the 'BlackBerry Z30' smartphone. This is second full touch device running on latest version BB10.2 Operating System. Now in World, trend of making 5+ inch smartphone are now normal, most of Android smartphone coming with 5+ inch display, though BlackBerry tried to take part in the large display maker race. The BlackBerry Z30 offering a 5-inch Super AMOLED HD display with a resolution of 1280 x 720 pixels which makes 295 ppi pixel density. The Z30 is powered by Qualcomm Snapdragon S4 Pro 1.7 GHz Quad-Core processor and 16 GB of on-board storage with microSD card slot support up to 64 GB with a 2 GB of RAM for smooth process on BB 10 Os. The BlackBerry Z30 can easily handle in your palm with measure 140.7 x 72 x 9.4 mm. The 9.4 mm thickness is more than BlackBerry Z10, but this gives you a benefit of a long life battery. Yes, the Z30 is packed with a 2,880 mAh battery which gives you non-stop ( mixed use ) 25-hours of battery life. The Z30 have a 8-MP of rear camera with an f/2.2 lens that is capable of video recording at 1080p and it also have a 2-MP front facing camera that can help you to record video and chat at 720p. BlackBerry hasn't declared on availability and price of the Z30 but the Z30 is expecting to be available next week in the UK.